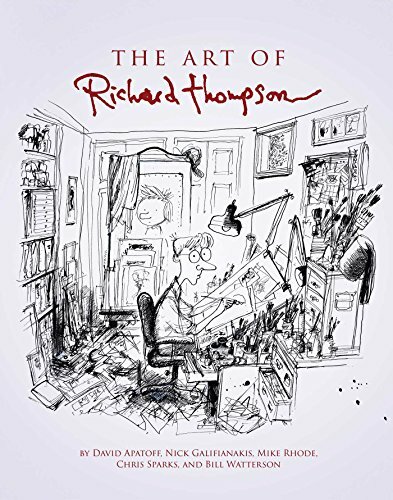 The long awaited “Art of Richard Thompson” makes a perfect Christmas gift for any illustrator, cartoonist and anyone who just appreciates great illustrations and comics. Richard Thompson is a multi-talented American cartoonist and illustrator. He is also the creator of the Cul De Sac comic strip. Unfortunately,he had to retire his comic strip “Cul de Sac” in 2012 due to Parkinson disease. In this artbook, you will see his incisive lineworks and comics in a new light. The art book is divided into various sections - Illustrations, Richard’s Poor Almanac , Caricature and his comic strip Cul de Sac. Each section starts with an interview with a prominent artist and even the reclusive Bill Watterson of Calvin and Hobbes was roped in to be interviewed. That is how good Richard Thompson is! There’s also an interesting segment in which Richard Thompson shares his enthusiasm in his favourite pen nib and its history, and you can see that he is a great humour writer too. Thompson’s art has a certain childlike quality in them and his pen and ink illustrations are uniquely his own style, even as he was influenced by Ronald Searle in his much earlier works. I love his caricatures and the way he is able to keep the essence of the personality with his ink and wash - like having Hilary Clinton as a clown or Al Gore doing an Elvis pose. His “Cul de Sac” section has him sharing how he started on the comic and how it evolved to its current form. The images in the book are beautifully printed and they show this great cartoonist’s extensive works. This is definitely one of the best artbooks for 2014!